Darren Criss has been one of the top breakout stars from the Glee franchise, and he’s just been asked to break into a role as a host for The X Factor. So many famous names have been in the running to fill the vacant spots on The X Factor, including Janet Jackson, Britney Spears, Avril Lavigne and LeAnn Rimes… but all of those women are associated with the open seats on the judges’ panel. Who has been asked to replace Steve Jones and host the show? E! 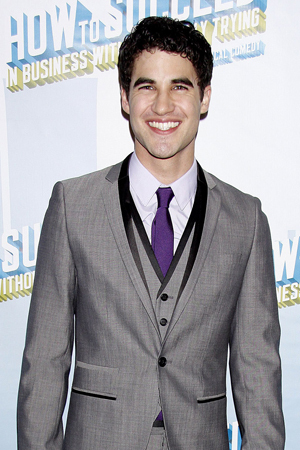 News reports that Darren Criss has been offered the job! We already love watching him weekly on Glee, where he plays the role of Blaine, the former Warbler and Kurt’s current boyfriend. He also just debuted on Broadway in How to Succeed in Business Without Really Trying, succeeding Daniel Radcliffe and passing the baton to Nick Jonas. Oh, and he wrapped filming on the upcoming movie, Imogene, alongside Kristen Wiig and Annette Bening. Can the busy man of music jump from one Fox television show to another? Would he have to give up all his solos on Glee in order to pick up a mic on The X Factor? Will Kurt and Blaine be able to stay together?!? Thankfully, none of these questions need answers — Criss has politely declined the opportunity. His schedule is busy enough, and he’s prioritizing performing over hosting a show that watches others do so, says a source to E! News.